Microphone is a transducer, the sound air pressure create vibrations and Microphone changes it to electrical signals. Microphone is actually a kind of sensor. We talked about sensor in previously published article, Microphone is also a sensor which was discovered by Thomas Alva Edison in 1877. Edison developed hearing problems at an early age out of Middle Ear Infection from Scarlet Fever. It is not possible for an average person life long to hear properly after such condition. But he was Edison; from Bulb to phonograph, motion picture camera – behind all is Edison. Actually the basics of Microphone is still that was invented by Edison. If you reverse a speaker, it will become a microphone. That is said, but the quality will not so good as the thing’s design is not to catch the sound. What Wikipedia copy paste writers do not know – a telephone can not operate without a Microphone – Antonio Meucci developed the basic microphone on 1860 but unable to take patent as he had not much money. No, there was difference between what actually Edison did. But, if we need to say, who is the Father of Microphone, that should be Antonio Meucci. History is saying, Alexander Graham Bell has said it. Fritz Sennheiser passed away just three years back (in 2010), he has quite good contribution on Microphone. Fritz Sennheiser is the founder of the company Sennheiser. Wikipedia deliberately not mentions he names – the companies are still active and with money you can buy a page on Wikipedia, link is small matter. Dynamic Microphone : The singers in live shows seen to hold a ‘pipe like thing’ – that is dynamic microphone. It is not named dynamic because the rockstars makes various dynamic gestures with it – its named for the moving dynamic coil inside it. As the principle is basic, the mouth requires to be closer. The reason it is still used is – despite the need to make the gesture of almost biting an ice-cream cone, it is very robust against mechanical stress. Ribbon microphone : The diaphragm of these microphones is folded aluminum strips of two to four millimeters wide and a few centimeters in length. It is only a few micrometers thickness. When excited by incident sound, it induces a magnetic field. This is you will see in radio stations with their branded metallic label with a stable short base. As they order to the OEM in bulk, they brand for the radio station. There is a historical reason behind it. They are never moved or avoided to be moved. Other types are still date, not used in mainstream. Direction : For example Apple always mentions the word bi-directional in their devices. A figure of 8 or bi-directional microphones receive sound equally from both the front and back of the element. That is why, if you attach your EarPod with MacBook Pro, there will be hardware level noise cancellation. Shock mount : You will notice the usually black colored three dimensional star like structure made of kind of wire around studio setups. This is holder like thing. This helps to reduce the noise from the surrounding area, without affecting the sound of the microphone. 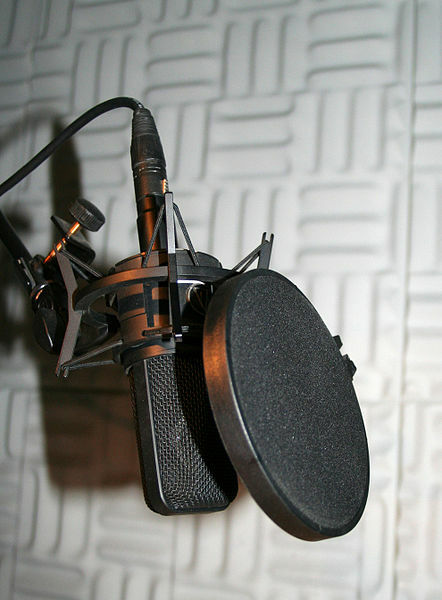 Pop shield : Sometimes a disc like thing is added in front of a Microphone. The reasons are practical – some people shower their saliva while talking ! Plus many throws various kinds of extra air instead of actual talking something. If you start to laugh, you will understand the production of the extra air. In India, these are are called pompom. I do not know the reason but locally in any country, these typically has a name. Cover : Nowadays funky colored covers are used – blue, green etc. In studio always its black. Pop shield can not be added for a live show. Instead the microphone’s head is covered with a kind of disposable thing like wearing it a sock. So the setup is not that easy. This is the reason why you hear a bit more bass voice of me in YouTube videos. Cite this article as: Abhishek Ghosh, "Microphone : Technical Details and Setup," in The Customize Windows, April 10, 2013, April 18, 2019, https://thecustomizewindows.com/2013/04/microphone-technical-details-and-setup/.